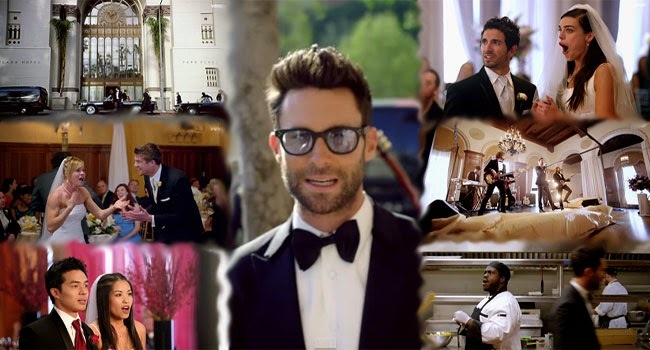 Maroon 5 lead by Adam Levine crashed a couple of weddings as part of their official music video for their new song ‘Sugar’. The official music video had been posted on YouTube on January 14, 2015 and had been viewed more than 1.3 million times as of writing. The video featured the band going around, crashing weddings without the knowledge of the wedding couple and their guest. The crew had suddenly entered the venue and set up curtains only to come down and reveal the band singing their new song and giving one of the best surprise any newly weds could ever have. As reported by ET, Adam Levine shared that the preparation had been stressful but the seeing the shocked faces of the groom and bride and the experience had been fun. He further said that he felt good to give such a surprise and make people happy. He even added that he was happy that the people liked their band because if not, it could have been a disaster. The video had been directed by David Dobkin who was also the brains behind the hit movie Wedding Crashers. On the video, Levine said that they had crached the weddings on December 6, 2014. Though it is not clear if they did it in just one day, it is evident that they had enjoyed making the video. While there are some speculations that the weddings had been staged for the stake of the video, many voiced out that it is more important that the music video had been enjoyable and the thought of the band crashing weddings is also sweet and touching. Some say that if the weddings were made up then it seemed impressive and the concept was a good idea.